Thinking ahead to a likely visit to Provence, I read what must be the best possible book for Provence tourists, Jean Giono’s The Horseman on the Roof (1951, tr. Jonathan Griffin). An Italian nobleman is passing through Provence for some reason. He has the bad luck, although in a sense his luck is better than that of many, to be there when the Asiatic cholera of 1832 breaks out, killing about a hundred thousand people in France on this pass. Giono describes, in repulsive detail, I would guess about ten thousand of those deaths as Angelo rides and fights his way to – well, not safety but rather more comprehensible dangers. Its symptomatology underlined its horrifying nature: it appeared suddenly and could theoretically strike anyone, leading with plague-like probability (more than 50 percent of cases) to death in a time that might be as short as a few hours. Unlike smallpox, which causes a high fever, cholera is always described as a “cold” illness; unlike tuberculosis or “consumption,” it is ill suited to any romanticism. How handy for certain kinds of plotting to have a disease that makes characters drop dead on the spot. The perverse thing is that The Horseman on the Roof, although constructed on a pile of blue corpses, is at heart 1) a complex and artful depiction of the Provence landscape and 2) a work of deep humanism. Angelo, the Italian horseman, is deeply, existentially, concerned with heroism, with honor and glory, which makes him a plausible man of his time, but also with serious questions about how to live that are more those of a French writer of 1951, or of today. How to do good. I will make some attempt to pursue those ideas in my next couple of posts. The 1995 Jean-Paul Rappeneau film, and how else could it function, tones down the horror quite a lot and turns the story into more of a Dumas-like adventure. Much of the pleasure of the film is spending time gazing upon two actors who were among the best-looking humans on earth; too much body horror would spoil the effect. I likely remember the movie poorly. That was over twenty years ago. so long as we do not interfere with the traffic - Kipling rides "With the Night Mail"
The real masterpiece of Actions and Reactions, I thought, was “With the Night Mail,” a science fiction story about a mail run from London to Quebec in a lighter-than-air craft powered by a magic ray. The narrator is a journalist along for the ride; the text is his article, written, apparently, for some kind of aircraft trade journal. Commenter Katy yesterday called the story “steampunk as written by John McPhee,” which is just right. We learn everything we wanted to know about oranges or Wyoming geology or futuristic aircraft – more than we want, honestly – as told by the men who grow oranges or geologize in Wyoming or operate those dirigibles. Unlike the diligent McPhee, Kipling just makes it all up. The eye detects no joint in her skin plating save the sweeping hair-crack of the bow-rudder – Magniac's rudder that assured us the dominion of the unstable air and left its inventor penniless and half-blind. It is calculated to Castelli's "gull-wing" curve. Raise a few feet of that all but invisible plate three-eighths of an inch and she will yaw five miles to port or starboard ere she is under control again. Etc., etc., sure, why not. Kipling approaches the unreadable. This is his feat of technical heroism akin to the great pilots and engineers about whom he writes. Just as they approach disaster during storms and so on, Kipling approaches pure gibberish. The art is two-fold, at least; first, continuous touches like that bit about the fate of the inventor – imagery, character moments, little ingenuities. Little handholds to delight the baffled reader. Then second, his total commitment to his concept, to the fantasy world he has created, a commitment rare, in my experience, among science fiction writers, who are seldom quite so unfriendly to their poor readers. This commitment is clearest once the future story has ended but the actual story continues with a series of announcements, advertisements, a book review, and an advice column. Although the spirit is comic, none of the extra material is exactly meant to be a joke. It is all part of the commitment, part of Kipling’s unwillingness to leave the world he has invented. He is like Tolkien working up Elvish. She is responsible only to the Aërial Board of Control – the A. B. C. of which Tim speaks so flippantly. But that semi-elected, semi-nominated body of a few score persons of both sexes, controls this planet. “Transportation is Civilization,” our motto runs. Theoretically, we do what we please so long as we do not interfere with the traffic and all it implies. Practically, the A. B. C. confirms or annuls all international arrangements and, to judge from its last report, finds our tolerant, humorous, lazy little planet only too ready to shift the whole burden of private administration on its shoulders. “With the Night Mail” is not just science fiction but Utopian fiction, with a rather specialized Utopia appealing to writers who think the engineers should run things. What looks like a conceptual, idea- driven piece is in fact pure self-expression. Kipling creates a world in which he would like to live and then lives in it for a bit. He is – or would become? – sufficiently aware of the dangers of his Utopia that a few years later he would write a sequel upending the whole thing. One odd feature of the story is the use of mail delivery as the epitome of technocratic heroism, but I have just read Antoine de Saint-Exupéry’s little first novel, Night Flight (1931), which is specifically about the heroism of nighttime mail runs by early aviators, and boy does Saint-Exupéry mean it, so Kipling was not being idiosyncratic but prescient. Rudyard Kipling’s Actions and Reactions (1909) is the weakest of his short story collections that I have read, and I think that I just have three more to go. It is nevertheless fascinating, often most so when it is most wrong-headed. Complete mastery, ingenious and artful, applied to exasperating material. This book is the most wrong-headed Kipling I have read; maybe that is what I mean. … two-inch deep honey-magazines, empty, but still magnificent, the whole gummed and glued into twisted scrap-work, awry on the wires; half-cells, beginnings abandoned, or grandiose, weak-walled, composite cells pieced out with rubbish and capped with dirt. Kipling had recently become interested in bee-keeping. If anyone has earned the right to animal allegories, it is author of Just-So Stories, but this one makes no sense. What is the parasitic wax-moth supposed to do? It is her nature to invade bee hives. She can do nothing else. Maybe that is Kipling’s point. Two stories are not allegories but parables of imperialism, as usual complicating my ideas about Kipling’s ideas without making me any less – I would not normally say appalled, but “Little Foxes” is appalling. The new English governor of the new English colony of – something near Ethiopia; this is all made up – discovers that his new country has foxes. The poor fox “could not understand the loud cry which the Governor has cried.” He cannot guess what is about to hit him. The English proceed to organize the entire country on an English fox-hunting basis. In many ways it works. There is an insight here about the value of the rule of law, however arbitrary its basis. Kipling may well have meant for me to find this story appalling. I am not sure. The main plot as such is just one of Kipling’s prank plots, thin stuff. “A Deal in Cotton” is a narratorial masterpiece, with an Englishman describing a colonial African incident that he does not fully understand, because he was feverish when it happened, and his Indian servant re-telling the story in a way that contains its own elisions, with a let’s call it “true” story emerging out of the combination; it is more or less about competing kinds of imperial rule. The game here, the skill, is in the omission of information. No one was better at that game, not even Henry James. What else. “Garm – a Hostage” is a perfect dog story, and “The House Surgeon” is a perfect ghost story. My doubt is if they are anything else, not that they need to be. I have avoided mentioning the single story that seemed to me like a narrow, frustrating, surprising masterpiece, “With the Night Mail,” a science fantasy that is also perhaps nothing else. I want to save it for tomorrow. Technically, Actions and Reactions is almost beyond belief. Paris Peasant - Louis Aragon wanders around - A laudable error. But a delectable folly. Paris Peasant, Louis Aragon, 1926, translated by Simon Watson Taylor. A Surrealist novel, in some sense, although I do not understand what use there might be in calling this a novel. The book contains a short preface that I did not understand; a hundred-page tour of the shops in a covered passage, destroyed just after Aragon wrote the piece, that is a classic of Paris flaneuring; another bit of wandering in the Parc des Buttes-Chaumont, this time at night, and accompanied by André Breton; and a final manifesto-like piece that I did not understand. The book is well written and well observed when Aragon wants it to be. A classic of urban writing. A classic of looking around. Not so far, really, from how I think about art. After a long absence, I always feel like I have to remind myself how to write, so I will burn off this piece by writing about Conrad Aiken, useful for practice since almost no one cares about Aiken. The last two books of his that I read were Punch: The Immortal Liar, Documents in His History (1921) and Priapus and the Pool (1922) – I know, what titles, yeesh. But both are books as such, not collections of the poems of the moment, and thus unrepresented in Aiken's Selected Poems not because their contents are inferior but because the poems need the company of the rest of the book. Aiken, since his earliest poems, had a tendency to turn his female characters into an abstract, idealized, Woman, which is perhaps not a problem from the point of view of accuracy, representing the all too real psychology of his male characters, and presumably himself, but is nonetheless tiresome. I know it is too much to ask, physician, to heal thyself, but at least critique thyself. Well, in these two books Aiken critiques himself. Priapus and the Pool employs a symbolic male/female symbolic dichotomy that is not so original – lust versus love, restless motion versus stable depth, like that – but the directness of the confrontation has some interest. The most curious effect is in the poems in which the voice is ambiguous, where the speaker could be either Priapus or the pool, with the meaning of the poem changing accordingly. Unfortunately, the diction is high Romantic, or perhaps Symbolist, and any quotations will make Aiken look ridiculous. I wonder if he had been reading D. H. Lawrence. Punch: The Immortal Liar, though – this one is different. The title character is the marionette. His wife is the much-abused Judy. Did he hurl her down the stairs, or was she driven to suicide by his abuse and philandering with Polly Prim? Punch is a trickster figure, and a mix of Faust and Mephistopheles, with a Walpurgisnacht section. Is he the devil or merely a puppet? “Listen! you puller of strings! To give me a name, – and give me so little beside? . . . The poet then, for a stanza, exercises his power and makes Judy “real” for a moment. Who stare, without thought, at a motionless world without meaning. I returned for two days, and will now wander off somewhere else, so no writing for all of next week. Two days, one to whine and one to glance at my vacation reading, The Old Wives’ Tale (1908) by Arnold Bennett. In ordinary circumstances, I would have taken many notes and written about the book for a week, but no note-taking while on vacation and see above. Constance and Sophia are sisters. Their life as teens takes up a quarter of the novel. The sisters separate, Constance staying home, Sophia ending up in Paris, where she lives through the grisly Siege of the city. Eventually, they reunite. Eventually, they die. This summary could be made by anyone who has read not the novel but simply the table of contents. An innovation of Bennett’s is that the sisters’ stories are not interwoven but told separately, the stay-at-home first, the Parisian second. It feels less like reading a six hundred-page novel than four separate hundred and fifty-page novellas, sequels but with a branching path in the middle. Bennett was a great student of the French novel, of Balzac, Flaubert, Maupassant, and Zola, but there is little in the voice or technique of the novel that he could not have learned from William Thackeray. Bennett’s narrator, in his incessant light irony, reminded me of the narrator of Vanity Fair more than that of Germinal. He describes more furniture and clothing than Thackeray ever did. That is like Zola. And some of the Parisian scenes, especially the scenes around the 1870 war, come close to imitations of Zola. The Old Wives’ Tale is a domestic novel, with intrusions of melodrama, so even the Siege of Paris chapter is about ordinary life during the crisis, albeit ordinary life as experienced and even determined by a strong-willed, upright Victorian woman. The novel, the French part, at times resembles a mix of L’Assommoir and Cold Comfort Farm, with the industrious Sophia determined to reform the corruptions of Zola’s ethos – of Paris. And heck if she doesn’t succeed. Some of this stuff is pretty funny. Bennett’s comedy is generally pretty strong. Reading an earlier Bennett novel set in roughly the same place, Anna of the Five Towns (1902), seraillon wrote “[i]t’s as though Bennett has refused to let go of the dominant form of the late 19th century novel,” and The Old Wives’ Tale has the same feeling of continuity. Anyone comfortable with the English Victorian novel ought to be happy with Bennett, as with Forster or Wells. It is not yet 1910, when everything changed. Bennett, like his contemporaries, critiques the values of earlier Victorians, but gently, mostly. The long scope of the novel, which begins in the 1840s and ends in the 20th century, creates much of Bennett’s irony. Sophia may have lived the more dramatic life, but back in the five towns every little change – like a store putting up a sign – is a source of drama. The metaphysics of the novel is grounded and pessimistic, authentically Naturalist. People follow their temperaments. They change, and yet they do not, cannot. Thus the strategic decision to start the novel when the sisters are teens, more or less formed, skipping their childhood. This looks like my notes for the five-part, quotation-packed series of posts I am not going to write. Oh well. Strongly recommended to anyone with a basic sympathy for the form of the long Victorian novel. I was not going to write my usual praise of French bookstores, or, really, my lament about American bookstores, not this time, but near the end of my trip to France I was driven into embarrassment, as we can see on the left. 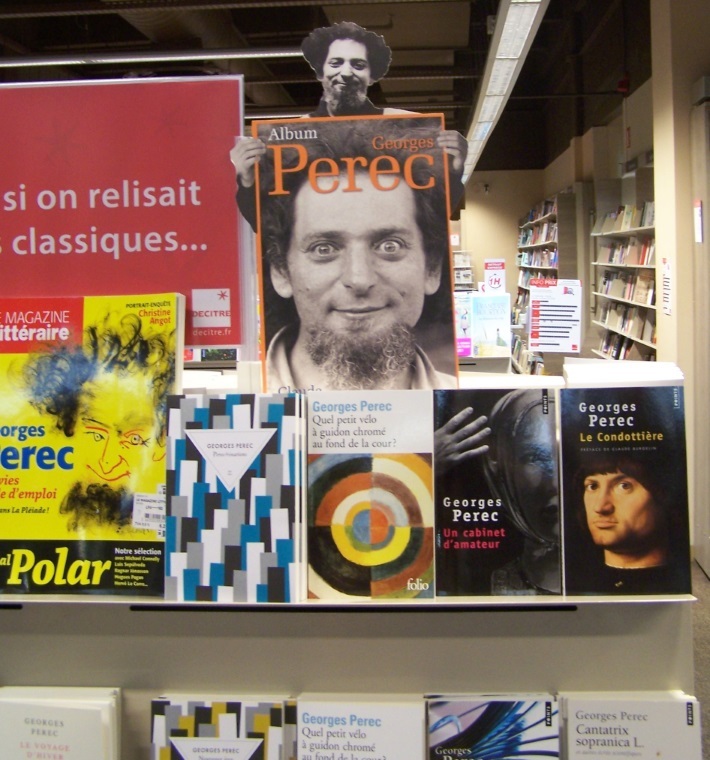 What we see here is part of the display of the works of Georges Perec, as found in the Decitre bookstore in Lyon – not the giant Decitre but the one at the mall. The occasion is the release of the Pléiade edition of the works of Perec in two gigantic volumes, a stamp of Official High Status. Lyon is a big city, but I found similar displays in the windows of two bookstores in Vichy, a town of 25,000, although a spa town that gets thousands of visitors. But visitors who want to buy expensive editions of fifty-year-old avant-garde novels? Yes, to some degree, apparently. The great touch is the cardboard Perec holding a gigantic copy of his Pléiade “album,” or I guess really a tiny cardboard Perec holding a regular sized “album.” A publisher designed, printed, and sent around this special display. A bookstore employee punched it out and assembled it. I saw it in the windows of many bookstores. There were also posters. I am trying to compare the marketing effort to that which will accompany, say, the Library of America editions of Don DeLillo, who was born in the same year as Perec. Heck, the Philip Roth books did not get this kind of promotion. Again, I remind myself, this particular photo is from the bookstore at the shopping mall. French bookstores are legally protected in a number of ways, but this is really a difference of culture. 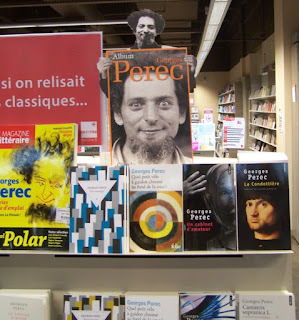 The ban on price discounting does not cause bookstores to give so much space to an author like Perec. Does it actually sell books? We, in the United States, do not treat our artists as well as we should. Not that little cardboard figures are such good treatment in and of themselves. Still. To the right is one of Lyon’s many building-sized murals, this one devoted to writers and books and Lyon's history as a center of early modern publishing. It’s culture, culture, culture. Disclosure: I have never read a book by Perec. It is the principle of the thing that galls.